The Freckled Fox: A Michael Kors Giveaway! 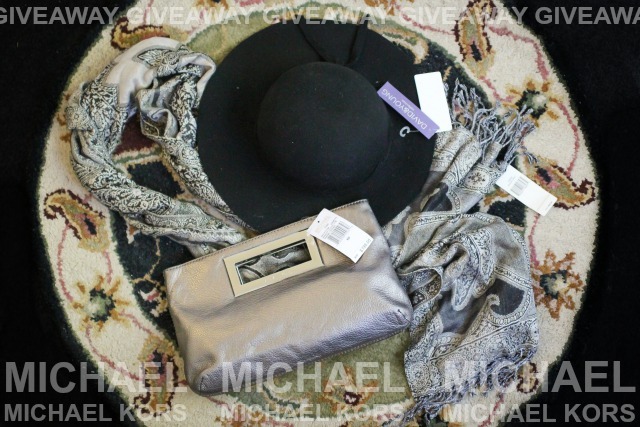 I've been a huge fan of Michael Kors ever since Season 1 of Project Runway, so when I had the opportunity to giveaway this fantastic clutch I had to take it! 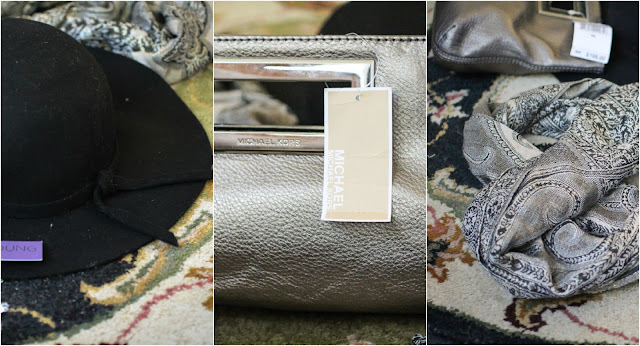 Its from the The Michael Kors Berkley Collection, is made of soft genuine leather in a metallic 'gunmetal' grey, and is a little over-sized at about 8" tall and 12" wide. I love it so much! I also couldn't resist pairing it with this gorgeous all-season scarf from collection18 that has a million different colors of grey, and this 100% wool black floppy hat from the David & Young D&Y. And on a side note, the items have a combined value of almost $300! I just love how each item can work for every month of the year, because I hate transitioning things out of my closet with each season change:) But I'll stop going on and let the giveaway begin! We're so happy about all we've been able to cram into into the warm weather weeks, and I hope you've been having a great Summer so far! Thanks for stopping by today, and good luck with the giveaway! I have two fun mini-vacations planned next month - spending the weekend in Chelan and going to Portland! Something fun I'm doing this summer... random road trips with my boyfriend! Also the image to repost on IG is not there? So I made my own? This summer I was able to go to Seattle and Portland with my handsome husband! It was great to back to where we love. something fun? we went to the river for a bbq was a great day! I went to Washington DC and Vegas! My vacations were early and now I have to wait until December for my next one. I have been working and swimming. We've taken trips to see family and we're headed to California at the end of the summer to meet my new nephew! I wanna go to London this summer! I need to have a shopping week! the most fun thing I did this summer was take a day off to go to the Bronx Zoo with my husband. It's expensive, but so beautiful and well-worth the price! I have been spending my summer relaxing, reading some awesome books, hitting the beach, hosting cookouts and eating tons of s'mores. The BF and I spent a week in Santa Barbara, it was pretty amazing! I took a road trip down the Florida Keys for some fishing and relaxation. this august im heading to orlando to see my new baby nephew and also heading to Texas to meet my other new baby nephew. Oooo! Thanks for another awesome giveaway! We (my family and I) recently returned from San Antonio...we did SeaWorld, The Alamo...the whole shebang! We (my family and I) just recently returned from San Antonio...we did SeaWorld, the Alamo...the whole shebang! Flew to Virginia for a week just to spend time with family! Aunts, Uncles, Cousins, Grandparents, … everyone. That and planning my sisters apple orchard wedding! Flew to Virginia for a week just to spend time with family! Aunts, Uncles, Cousins, Grandparents . . . everyone. That and plan my sisters apple orchard wedding - 17 days!!! The best thing I've done this summer is relax, hands-down. My previous, oh, four or five summers have been insane, and this summer, it's been nice to just live in my house. The most fun thing I did this summer was doing my garden and growing all kinds of veggies in my backyard and being able to see that they are growing beautifully. this is a challeging comment - so far i've had fun with my kids - and i enjoyed it! So far this summer I started a new lifestyle (eating healthy & excersing). The reason is for the vacation my first wedding anniversary in December to Paris. ive been interning with an australian company all summer! Great giveaway Emily! I love the clutch! We've had a few really fun backyard barbeques this summer! I took 20 of my friends to my grandpa's house on the lake for an overnight camp-out. We did Dutch Oven cooking, roasted Smores, and stayed up till waaayyyy too early the next morning telling stories and laughing around the campfire. Getting used to being a Stay at home Mommy in Arizona!! We moved from CA and I left my job. It's hard to keep my little girl entertained inside when it's 110 outside!! weve spent a LOT of time at the beach! Decorating a nursery for our little girl! So far we've spent nearly every day at the pool, weather permitting! My daughter is 17 months old and it's been fun getting her use to the water and seeing her eagerness as we approach the steps to the pool! I grew up with a fear if water so it's nice knowing that she'll have a love and healthy respect for it! We've spent nearly everyday at the pool this summer! First summer with my hubby ... Happily ever after :) Loved it! My family is spending the day at Disneyland next Tuesday! I just love going to the beach! We took a trip up to Callaway Gardens -- so gorgeous and fun! I fostered a litter of 4 kittens for 8 weeks this summer. They were only just brought to the SPCA 2 weeks ago to have them get adopted out - and 3 of them have already been adopted! Love your blog, btw. You have a fantastic style, and a sweet spirit I admire. My boyfriend is turning 30 this year and he has never been camping! So I am planning a surprise trip to the Florida Keys where we will be camping on the beach!!! I'm so excited and I can't wait to see the look on his face when we arrive! I'm excited about working on some house and office decoration projects on a budget this summer! I'm going on a little thrifting trip this afternoon to kick start some of these! I'm excited about some home improvement projects I'm doing on a budget this summer. I think my new house will feel so much more like a home when I'm done, but it won't cost a mint, so I'm happy about that! Going thrifting today to jumpstart some of the projects. We will be heading south to spend a week w. my sister and her family! I am learning a new language! Last night, my husband and daughter and I went to the local races! It was so much fun betting on the horses and really just seeing them close up. They are such beautiful animals! Went to Paris, and played with some honey bees! I'm planning a little vacation for my fiance and I right before school starts up again and wedding planning starts getting really crazy! Hey Emily!! This summer, I went on the first beach vacation I have been on in SIX YEARS!!! It was so great!! We went in the early summer before it got miserably hot. We had perfect weather the whole time!! Hi! So far i was relaxing , i am now planning on going to swim! I have spent this summer chasing after my 20 month old!! After 7 years of trying to get pregnant it is by far the most fun I have ever had!! Also planning a little beach trip in September with the family and we are so ready for a getaway!! I'm pregnant, too! Just hearing baby's heartbeat, seeing "shim", and feeling the movements has been incredible.